Christmas Comes Early in West Lothian! A 2018 cycling calendar - featuring 13 striking illustrations - has been produced by a Scottish cycling club, as part of a fund-raising campaign to help get a traffic free cycle circuit built in West Lothian. West Lothian Clarion are asking cyclists to buy the perfect stocking filler with all proceeds donated to West Lothian Cycle Circuit community fundraising target of £25,000. One of the circuit’s fundraising patrons is Sir Chris Hoy who said "The 2018 cycle calendar is absolutely stunning. I'm looking forward to getting one in my stocking this Christmas! It's all for a great cause, the West Lothian Cycling Circuit will help turn Scotland into a nation of cyclists." The calendar was the brainchild of Clarion members Matthew Ball and Garry Marshall. 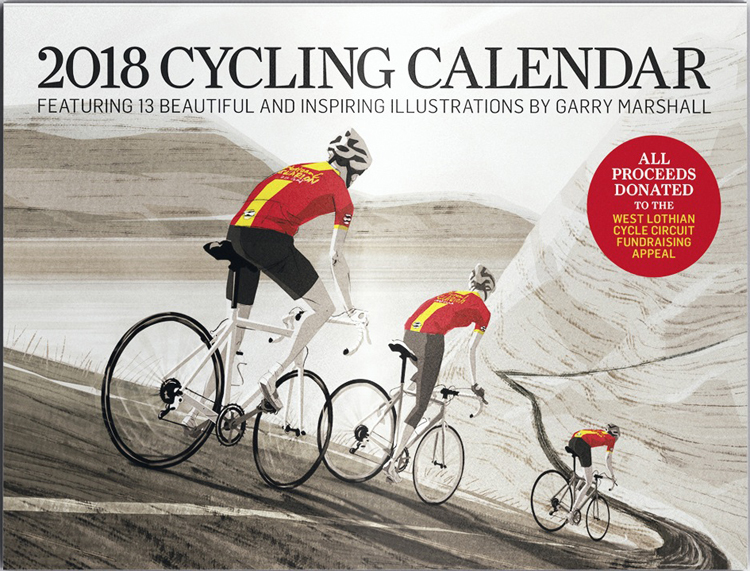 Matthew said “Garry and I have been producing our club magazine for 7 years with each cover featuring one of Garry’s beautiful cycling illustrations. We thought it would be great if we could combine all the illustrations into one amazing calendar and raise money for a good cause. It’s the perfect Christmas gift for cyclists everywhere. Every month features a different scene; cycle cross, mountain biking, club runs and track racing all feature through the year. This calendar is the latest in a series of fundraising ideas which have seen cyclists of all levels, including Olympian Katie Archibald, taking part in cycling challenges. Over £12,000 has already been raised in 4 months. The hope is that the print-run of 1000 sells out, well before Christmas. Matthew is one of the coaches in the West Lothian Clarion which runs cycling sessions every week for the 85 under 16s. “We’ve been coaching in car parks for seven years but we’ve outgrown where we are and need a better location so our 100 strong waiting list can be reduced." The Cycle circuit has been developed by the Linlithgow Community Development Trust, a community-led charity. It has ambitious plans to build a 1km traffic-free cycle circuit for everyone to enjoy. The closed road cycle circuit will be designed for easy access, suitable for all abilities including adaptive cycles and handcycles, as well as runners. Two thousand people will benefit from this facility every year, with 25,000 visits per year. • 1km of high quality tarmac road, 6m wide. • Floodlit for year-round evening use. • Unique cobbles section for an extra challenge, or training for the Paris Roubaix! • Road markings to aid cycle coaching. • Storage facility to enable storage of adaptive bikes and hand cycles. • Cycling Development Officer to ensure accessibility and inclusiveness for all. • Cycle ramp access to the Union Canal, part of the National Cycle Network.